When it comes to the stability and playability of the guitar neck, it is beneficial to spend some time thinking about the truss rod and which type is best for your application. 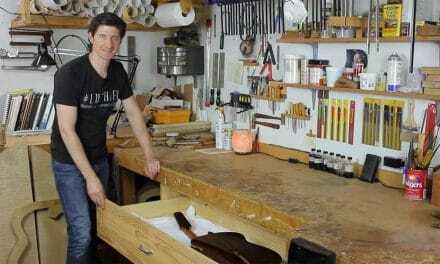 The guitar truss rod is a critical component of any guitar. Without it, the playability of the instrument cannot be effectively controlled over time as the instrument responds to the changes in its environment and to different sets of strings and playing styles. Sometimes the truss rod can even give the builder advantages in controlling the neck during the building process, enabling him to do a more accurate job creating the proper neck geometry. 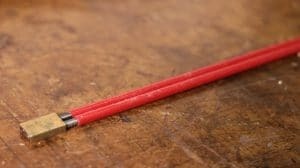 When designing a guitar, considering carefully which type of truss rod to use is vital to building an instrument that will play well and remain stable over time. So let’s take a look at a few different types of truss rods and their strengths and weaknesses. 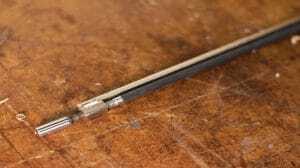 This type of truss rod usually consists of a single piece of steel that is threaded on one end to receive an adjustment nut and washer, and on the other end may be threaded on one side to receive an anchor bolt or bent into an L shape. These single action truss rods must be inlaid into a curved slot in the neck so that when the rod is tightened at the nut, it wants to straighten out, exerting force that pulls against the tension of the strings, and can help to relieve the forward bow induced naturally into the neck by the tension of the strings tuned up to pitch. A double action guitar truss rod comes in several different forms all sharing one thing in common, that being the addition of a second rod or metal bar above the main truss rod. The top bar is somehow fixed in length, and the lower bar is threaded on each end in order to allow it to expand in length or contract in length based on which direction the nut is turned. The nut is usually welded or somehow permanently fixed to the end of the lower rod. There are a few other variations I have seen over the years, but these are the main styles that I have the most personal experience using in my work. 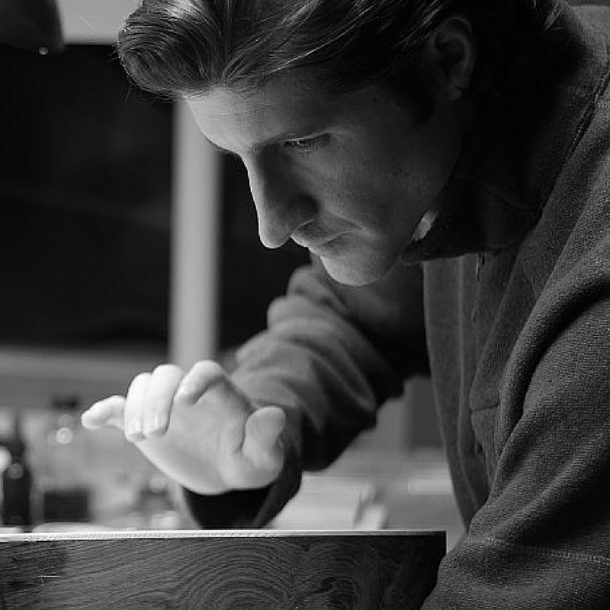 When I began building archtop guitars, I started in the traditional way, at least in the area of neck design. I used a standard single action truss rod. The great thing about this type of Truss rod is that it is very light weight and allows for the upper part of the channel routed into the neck to be filled back in with wood. This not only adds as little weight as possible to the neck, it can sometimes keep the tone sounding more woody and natural. I quickly found out though, that this truss rod is much more susceptible to the changes of the atmosphere that the guitar is in. Because this rod is compressing the wood as the nut is tightened, it is vulnerable to being affected (more than other types of truss rods) if the wood changes dimension. Wood constantly does change dimensionally as it absorbs and loses moisture based on the relative humidity that it is exposed to. The wood in the neck itself is functioning as part of the truss rod system. The nut is tightened against the wood. 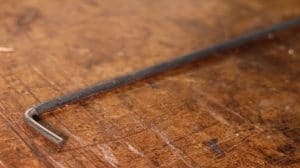 If the wood expands because the humidity increases, it’s the equivalent of someone tightening the nut on the truss rod and can cause the neck to move. Most of the time these movements are subtle, but if the guitar has a very low action they can make things difficult if the humidity is fluctuating a great deal and lead to fret buzz or high action depending on the level of humidity present. Not only that, but because wood is always different in density and strength, when using a truss rod that relies on its structure as part of the system the stability of the neck becomes a bit of a gamble. 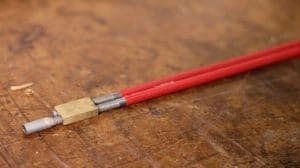 Obviously, the wood is providing most of the strength as the neck supports the string tension, but the truss rod must be there to provide consistent adjustment and stability. 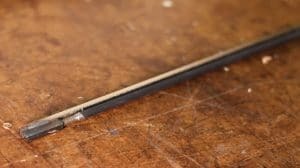 Because the wood is constantly fluctuating, I began to feel like it was a bit too risky using this type of truss rod, never knowing exactly how the neck would respond over time. I switched to using a type of double action rod, but with one-way adjustability at first (shown above, left). This was instantly a big improvement in adjustability. But it still only provided me with the ability to move the neck back against the string tension. And it was much heavier too. Being the crazy perfectionist that I am, I wanted control of the neck in the forward direction, as well. 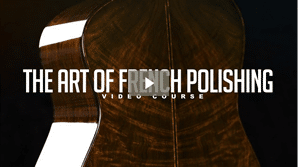 I use this forward bow feature most during the construction so I can get the neck perfect for fingerboard leveling, and for fretwork, both of which I discuss in depth, in my online guitar making course. 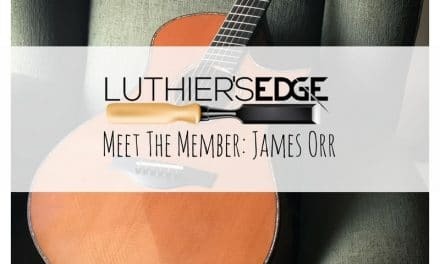 Many people only use and love the single action truss rod, it’s probably in more guitars than any other type, just wanted to point that out because what I’m sharing here is my own personal opinion and experience. You might find it’s perfect for your guitar. The double action two-way truss rod is my preference. There are two rods that I like very much. One design is the rod from Allied Lutherie (above) and also LMI though they are slightly different, the overall design is close to the same. 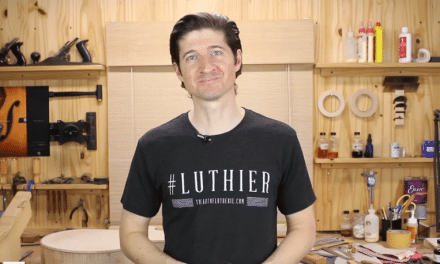 The latest version from Allied Lutherie is really beautiful and very high quality. The adjustment capabilities are very fine and work great, BUT, it weighs a lot! I loved the design of this so much that I looked into having this rod made out of titanium to get the great adjustment AND lightweight, but it’s patented, and it costs a lot to get them made out of the right type of titanium that really does weigh less and has the right strength. 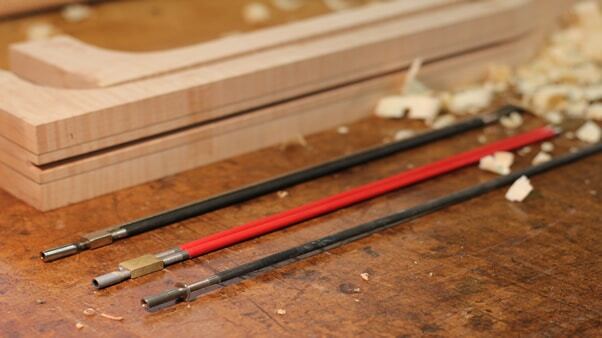 My favorite truss rod and the one that I currently use is made by Steward-Macdonald: The Hot Rod (above). 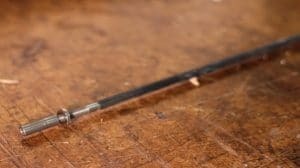 This truss rod is lighter than the Allied Lutherie rod and I also like the fact that the upper and lower bar is threaded into the nuts that connect them. I have always had a small nagging concern of the welded parts one day breaking on the other types of rods that I have seen. With the Hot Rod, I don’t have to worry about that. So the Stew Mac Hot Rod gives me the best balance of great adjustability both forward and backward, plus it’s the lightest double action rod I have found. One thing to mention though is that double action truss rods do have a tendency to buzz in the neck (vibrate sympathetically) when there is no tension on it if not installed right. 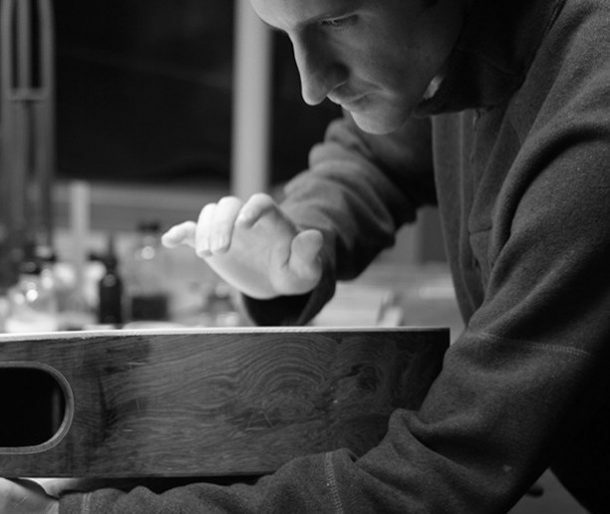 I have never had any problems on a finished guitar, they have all been perfect, but it is something to be sure you do properly when installing the rod. StewMac.com has some good info on how to do it right – Installation Instructions. The only thing I add to their steps is that I put some silicone in the middle of the rod slot, and in between the rods themselves in the center as well to keep those areas quiet too, just in case. I have been using the Hot Rods from Stewmac.com in conjunction with 2 carbon fiber reinforcement rods for over 10 years now and they have been great at keeping my guitar necks stable and resistant to fluctuation from string tension or changes in humidity. You can check out some computer printouts of my fingerboard and fret work as scanned by a PLEK laser. The PLEK returned a report that the fingerboard was perfect and needed no adjustments on two of my guitars that were scanned. Both of those guitars used the Hot Rod truss rod. You can see the printout and learn more about how I am able to accomplish a perfect setup in my online guitar physics and setup course. 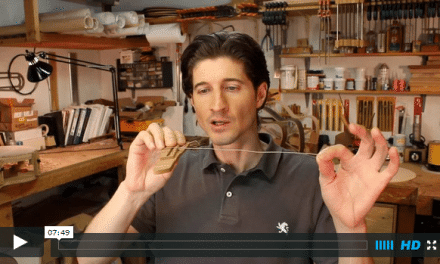 So that’s my take on truss rods, let me know what you think in the comments below and be sure to share this on Facebook too! I make my own truss rods, they are single action. But, are made like the double action. I need to find out how to make them into double action. If you folks would point me in the right direction I’d appreciate it very much. 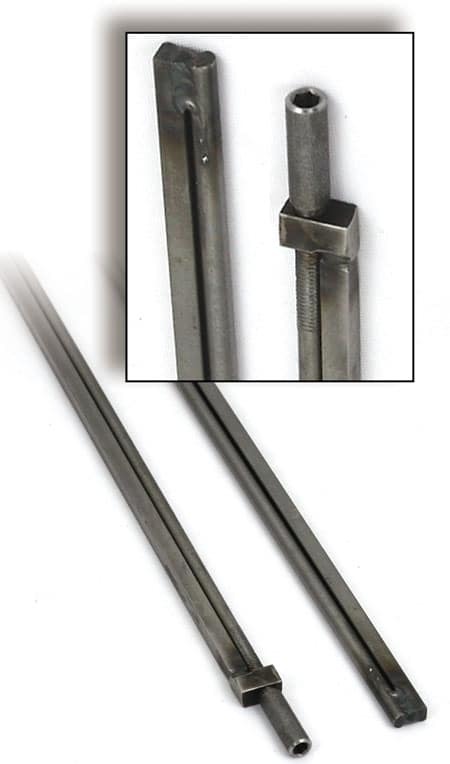 Hi Mike, the double action rod is threaded on both ends of the rod that turns (with opposite threads on each end). That way it can bow the neck backward to counteract string force when turned in the usual direction, but then when turned the opposite direction it will cause the neck to bow forward too. For me this is important when I do the fret work, so that I have full control of how I set the neck before filing the frets when I am doing the setup. I like to use the frets to make the neck strong by making the tang fit tightly into the fret slots. This can sometimes cause the neck to bow backward just a little bit, but with the double action rod, I can bring it back to the perfect position to do my fretwork and set up. Hi Tom. The problem I’ve always had with the double truss rod, the hot rod in particular is I had no way to control where the hump would bend up or down. Many times the rise would happen up around the 10th fret or even higher. Even though I used it for years when I would adjust I could never get the critical adjustment at the fret seven or around. So I went back to the single truss rod with the groove sloped in the area where I needed the rise to get exact playability on the neck. I’m curious as to how you control where the trust bar dips or rises on your neck. I love builders who are generous with their knowledge. As it wasn’t that long ago that everything was secret society…remember? Anyway, what you’ve written and what you’re doing for the improvement of guitars and the future builders is great. I try to just use the rod to get the neck back to the curve I need. So I really don’t use the rod to bend the neck which makes the bump less of an issue. I build the neck so that it has the curve I want built into it already, in the main neck/fingerboard joint, sanded into the fingerboard surface, and fretwork too. So the truss rod just helps to get it back to its original shape not really bending it or shaping it further. I know that’s not the best answer because it is tricky and can sometimes result in a bump where you don’t want it, but for me it’s been about the anticipation and pre-working the fingerboard surface to counteract those little things so they are never a problem.